Arrive Melbourne, Australia. A short drive to arrive and check into a hotel that has been arranged for you according to the class of hotel service requested in your vacation package. The rest of the day is yours to enjoy as you deem fit, a suggestion may be to tour the exciting city of Melbourne, and visit the Queen Victoria Market and shop for unique Australian artifacts. For the avid golfer, an additional round of golf can be arranged for your enjoyment. Overnight at the golf vacation hotel. Today you will play the Royal Melbourne West or East course. Boasting 36 outstanding golf holes, Royal Melbourne's 18 hole composite course is ranked No. 1 in Australia and No. 6 in the world. Designed by Dr Alister Mackenzie Royal Melbourne is a fine example of allowing the natural features of the land to dominate the layout. Venue of 16 Australian Opens, 3 World Cups, the 1998 President's Cup and a large number of important amateur and professional tournaments. Was the venue for the 2002 Heineken Classic. Non-golfers may wish to visit the Parliament House and tour this exquisite structure. Overnight at the golf vacation hotel. Play today will be arranged at Kingston Heath Golf Club. Ranked No. 2 in Australia behind Royal Melbourne's composite course, Kingston Heath is highly regarded as one of the country's finest 18 hole individual layouts. A true test of patience and skill, it has hosted several Australian and Victorian Opens and countless professional and amateur events. Laid out by Dan Souter in 1923, with bunkers redesigned three years later by Dr Alister Mackenzie. The Par 3, 15th hole is surrounded by some of the most intimidating and deep bunkers found anywhere in Australia. Non-golfers may wish to visit the Melbourne Cricket Grounds and watch the game of “footie”. Overnight at the golf vacation hotel. Metropolitan Golf Club awaits all challengers today. Completing Australia's top three ranked courses, Metropolitan's reputation as one of the best championship courses in Australia was further enhanced when it hosted the Australian Open in 1993 for the sixth time. 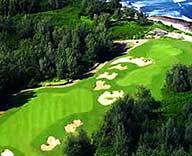 A plethora of native trees line the pure Santa-Ana fairways. It was the venue for the 1997 Australian Open and the recent Accenture Match Play Championship in 2001. Non-golfers may wish to visit the Royal Botanic Gardens and gaze at the stunning plants from Australia and the world. Upon completion of your round of golf, leave for the Melbourne airport or extend your trip with additional golf vacation arranged by our staff.